The game follows Lucy Baker, a beginning detective who is transferred to Scotland Yard. Here, she works under Alfendi Layton, son of the renowned Professor Hershel Layton. Together, they investigate crimes for Scotland Yard's "Mystery Room". 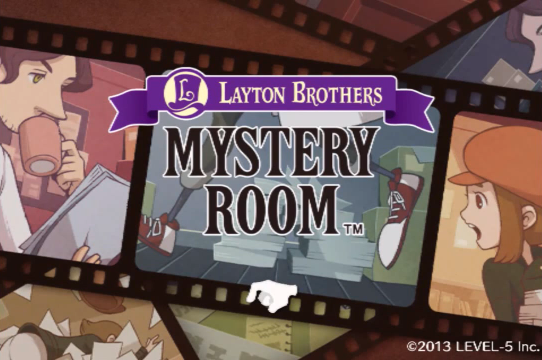 The Mystery Room is a spin off game of the Inspector Layton series. I haven’t played any of the other games so I have nothing to compare this one too, though from what I’ve seen it’s different from the other Layton games, but still a great deal of fun. For the I-phone the first 2 cases are free then you must purchase the rest of the cases in two separate bundles but end up totaling about $5 if you get them both. If you want to find out the story then you’ll have to buy both bundles and play all 9 levels of the game. This game’s immersive mystery solving game play struck me as very unique. Most ‘mystery’ games I’ve played are hidden object or puzzle solving games and while I’ve enjoyed them I’ve always been partial to games that allow me to work to solve the mystery and this one did just that. It makes you think by laying out the crime scene and allowing you to move through it examining each piece of evidence and then asking you questions pertaining to said evidence. You work your way through witness statements and questioning sessions to eventually solve the crime and confront the suspect. I loved being able to work my way through the crime scene and form my own opinions on what had happened. Being able to go back to it and the witness statements was often helpful in answering the questions that led you to the criminal. I found myself having to really pay attention to witness statements and what the evidence was because when it came to the questioning sessions even the small details were important. The game allows you infinite guesses, but it’s still a lot of fun when you’ve figured out the answer the first try. The second thing that really hooked me about this game was it’s story line. This is actually what brought me back to the game. Originally I didn’t want to pay for the rest of the cases, no matter how fun they did turn out to be but the story is what kept bringing me back to want to play more, it sparked my curiosity and I wasn’t disappointed in the end after purchasing and playing through all the levels. The story follows Lucy Baker a new detective who is assigned to work with Alfendi Layton,( affectionately known as Al or Prof) in Scotland Yard’s special unit called the Mystery Room. As the game progresses you begin to find out that there is more to Al than you realize, and that he is not telling you quite everything about some of the cases you come up against. My curiosity as to who he really was and what had happened hooked me and caused me to play through level after level as the story began to grow and things started getting more interesting. The graphics were always clear and the game never glitched on me. The loading times were very short and never got in the way of my enjoying the game. The only thing that may bother you as a player is the way some of the characters talk. I always found their accents and ways of speaking interesting and sometimes humorous but on the review in Apple’s App store some people had complained about it and I felt compelled to warn anyone who may play it that yes many of the character’s have strong accents and speak funnily sometimes. If this bothers you then don’t play the game. If you think it may bother you but your not sure then play the free version and make your decision afterwards if you want to purchase the rest or not. I really enjoyed the games music. It gave the game a definite feel of mystery and detective work and was fun. It really helped to pull me in as I was exploring , and especially when confronting the suspect. As I said earlier I wasn’t originally intending to purchase anything in this game but I ended up buying all 9 cases. For the price (around $5) it’s a good game. The game play was very enjoyable and for the unique experience the price wasn’t bad. If they made any more cases I would probably buy them as well. For me $5 for a full game is not bad, really I prefer paying for the game once (or twice in this case)instead of constantly having to dish out for in app purchases to keep me going. Overall I highly recommend this game if you have time to spare and enjoy solving mysteries. My only downside to the game is that I wish it were longer. Games I’ve found similar to this one: Nancy Drew PC games.